For the past four years Campbells has been the proud sponsor of the St Ignatius A-Level law programme, which accepts students from both St Ignatius and Cayman Prep School. Each year Campbells endeavours to identify new ways to enrich the programme for the students and to enhance their learning experience with their involvement. For the second consecutive year, the firm has worked with the programme instructor, Rhian Minty, to host a moot competition to put the AS and A2 students through a more practical form of testing. 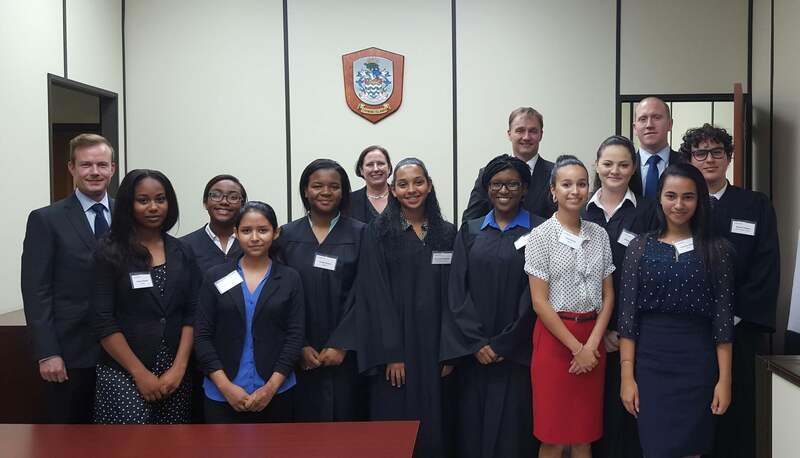 Following a successful moot last year, it was evident that the addition of the mock trial to the curriculum added valuable experience and truly gave the students a unique glimpse into what a career in law could hold for them. “As a student aspiring to be a lawyer, the Moot has shown me a glimpse of the realities of the court room environment,” says Janessa Prendergast, St Ignatius A-Level student and Team A Junior Counsel. “The opportunity was invaluable as I now have a clearer understanding to the extent of dedication and time it takes to fully develop a case that can withstand the pressures of opposition and scrutiny from the presiding judges. Preparing oneself, learning how to dress for a trial, address judges and coherently answer any questions asked was a lot of pressure but it was an excellent experience that I learned many valuable lessons from,” she concluded. Campbells’ Senior Associates James Austin-Smith and Kirsten Houghton played the role of the judges. The students also received advocacy training from litigation Partner, Mark Goodman and Senior Associate, Jeremy Durston. The students were divided into two teams which covered the roles of Claimants and Respondents in a contract case. “James Austin-Smith and I were impressed with the students who appeared before us in the moot,” Kirsten Houghton commented. “We noticed significant progress in the standard of those whom we remembered from last year, and promise in the new candidates. The students had worked hard with Campbells’ mentors, Mark Goodman and Jeremy Durston, and it was very hard to choose the winning team” she concluded. The firm is impressed with the calibre of students that participate in the A-Level Law Programme and is confident that these young achievers will have much to contribute to our community in years to come. At the conclusion of the moot, the attorneys were pleased to discover that at least 3 of the students now have offers to study for their law degrees in England for which we wish all the best in their future studies and careers.